NewBalance-Finding a NEW BALANCE on how to meet customer’s expectations! New Balance is a privately owned shoe and athletic equipment manufacturing based in USA and England.This Brand founded by William J. Riley more than 100 years ago and has a history longer than Nike, Adidas and some other athletic manufacturing businesses in the market. Not that the company started by manufacturing fancy suede sneakers from its start but, through selling arch supports to firefighters and police officers at the beginning, became more and more popular lately for its quality and unique design. This brand is competing with other mega athletic equipment manufacturing such as Nike, Puma, Converse, Reebok, Adidas, and other similar companies. A) Understand the product gaps and put together necessary action plans to respond to the market demand, and B )To identify the success of different product launches by getting feedback from its customer. On social media, The number of “likes” or “shares” is somehow a representation of how successful its customer has accepted the products in the marketplace. As evident as is, Social media plays an important role helping Businesses in promoting products especially in a B2C business model and particularly in the fashion industry as it allows a direct communication in real time from companies to their customers. The beauty is that consumers have instant access to the raw information from the brand itself, which makes the transfer of information accessible and quick. Celebrity endorsements is another significant advancement that businesses are blessed with for promoting their goods through social media, as the information is visible to the public and what is more important than visual perception in the fashion industry, note that this itself may result in increased sales drastically. 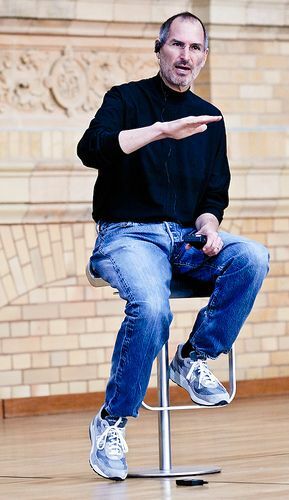 Steve Jobs, co-founder of the Apple Inc. was numerously appeared in his NB Sneakers, knowing the level of popularity of this public figure as people do look up to, drags peoples attentions towards everything he does including his apparel. A simple search of “New Balance +Celebrities” on Pinterest will bring you pictures of some of these celebrities wearing NB sneakers, in which may have its encouragement factor for buying products for its consumers. NB Team has utilized different social media platform such as Pinterest, Facebook, Instagram to connect with its customer and get to manufacture products based on the taste of its clients. New Balance Customize allows the customers to make their style sneakers in few simple steps. Use of social media allows the brand to promote this service through different channels and tailor the design to some extent based on customer’s tastes. This initiative is mainly part of product development for NB team as they opened up a stream of communication with their clients and get direct information from their customer that can be used for product’s design and enhancement. Getting voice of customers from the field is crucial for the survival of all types of businesses which often is difficult to obtain due to the size of the businesses .on the other hand, competitive marketplace creates an environment that forces organizations to operate and respond to the market demands promptly and in a rapid pace. Since the use of social media has empowered businesses owners and business managers to get a feel for the market’s needs with a minimum cost, Therefore, it has become more and more popular as it helps to set a vision and defines the roadmap for future developments.